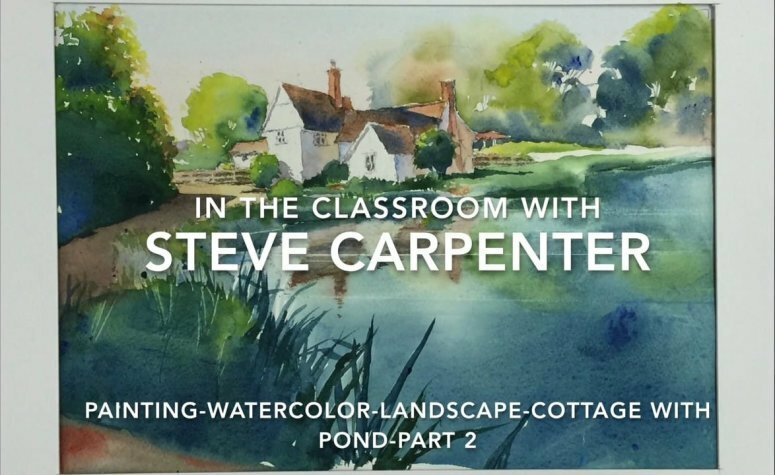 In part 2 of landscape watercolor painting video Steve begins by removing the masking applied to the house. The architectural elements of the painting are addressed beginning with areas in shadow. The darkest values of the cottage are painted, followed by the addition of foliage around the structure. The movement of color through the painting is emphasized. A detailed explanation of a watercolor technique for creating a realistic reflection in the water is presented. The video concludes with the watercolor painting of the water and roughing in the reflection.